t is with profound sense of loss that we announce the recent passing of our father, son, brother and friend Tim. Tim was born in Calgary Feb. 25, 1957. From the outset, Tim had a keen sense for sport and adventure. As a youngster, he excelled in hockey, skiing, racket sports, cliff jumping, or whatever game was at hand. Tim’s family operated a farm near enough to Calgary that he attended school there and established an incredible group of lifelong friends. 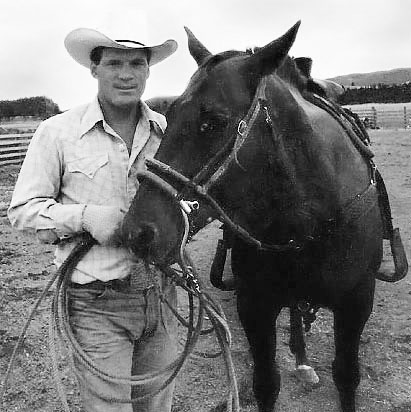 Tim went to the University of Alberta to study physical education, but after a couple of years, realized that he wanted to ranch and was hired on as a hand near Millarville. In 1981, the Proudfoots purchased a cattle ranch near Roosville, British Columbia. Beau West Ranches became Tim’s profession and passion. Tim loved horses and always had a good mount. He took pride in mastering horsemanship, including skills as a farrier. Tim was an accomplished team roper, dabbled in bull riding, dogging steers, calf roping, and even barrel racing. He enjoyed the company of rodeo life. He won a few buckles along the way whenever he could afford the time and the entry fees. Tim’s other keen passion was exploring the surrounding backcountry, and he became an avid guide-outfitter. His natural lifestyle was filled with risks and challenges. Tim liked it that way. It is fair to say he never said “Whoa” in a mud hole. In his 55 years of life, Tim cultivated many lasting friendships with all who dared to tag along. He lived life to the fullest, leaving many indelible memories for those who had the privilege of knowing him. Tim met his wife Kathy, nee Adams, and raised two beautiful and talented daughters: Carly-Jo and Jacey Lynn. Tim enjoyed every day he had with his girls and they filled him with pride in all their accomplishments. Carly and Jacey are both engaged to marry two outstanding men – Aaron Eldred and Brad Cleland. Timothy was predeceased by his father, Dr. William Proudfoot, whom he admired so much. His mother Julia, nee Cameron, remarried a great guy, Barney Connor, whom Tim and his four brothers, many nieces and nephews embraced into the family. Although Tim and Kathy went their separate ways, they always maintained a positive relationship centered on their children. Tim met his loving partner, Benita Jaspar, at the 2009 Calgary Stampede. Benita and Tim were embarking on a life together at the ranch at the time of his passing. If so desired, a memorial tribute can be made to The South Country Cowboy Association, 3856 Galloway Frontage Road, Galloway, BC V0B1T2.